(1)Tested in 10W oil at 70� F. Flow rates vary with fluid pressure, temperature, viscosity, inlet and nozzle type. (2)At 2.5 gpm (9.5 lpm) @ 70� F (21� C) with 10 wt. oil and 1 gal (3.8 l) dispensed. May require re-calibration. Out-of-box accuracy �1.25%. (3)Average shop use with alkaline batteries (included); 30-35% longer life with lithium AA. Rugged trigger guard protects meter from damage. Available with rigid, flexible or angled extensions. Easy-to-use control pad displays pints, quarts, gallons or liters. Easy-to-replace 9-volt alkaline battery. Resettable total for daily, weekly or lifetime dispense reports. 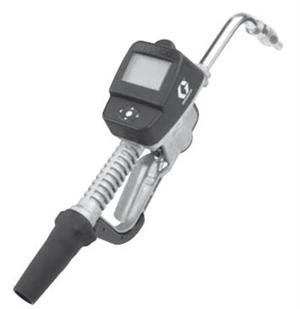 Dispenses in gallons, quarts, pints and liters, Easy- to-use control pad, Rugged trigger guard protects meter from damage, Easy-to-replace 9-volt alkaline battery, Resettable total for periodic reporting, and In-field calibration capability.